A very welcoming, open site, which is attractively laid out and cared for. The 230 grass pitches are flat and well maintained, with some shade and 10A electricity. Ten pitches also have water and drainage. 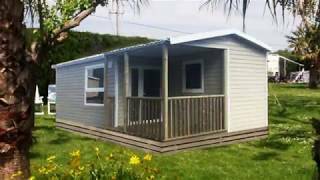 Thirty smart mobile homes are placed unobtrusively at one end of the site. A very pleasant pool complex has a lifeguard and the brightly coloured play areas are clean and safe. A great beach, noted for watersports, is a 200 m. walk through a gate at the rear of the site. A full activities programme for children allows parents a break during the day and there is organised fun in the evenings in high season. Full recreational facilities include a gym. The very Spanish-style restaurant serves high quality food. The owner, Juan Carlos Alcantara, and his wife have many years experience in the campsite business which is clearly demonstrated. You will enjoy your stay here as there is a very happy atmosphere. 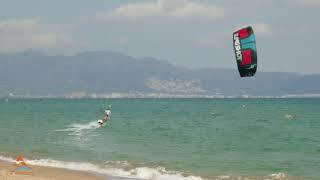 The beach is a magnet for kite- and windsurfers, and lessons and equipment are available nearby. Two excellent, very clean, solar powered toilet blocks include first class facilities for disabled campers. Baby rooms. Facilities may become a little busy at peak periods. Washing machines. Motorhome services. Supermarket, restaurant/bar/takeaway open all season (children’s menu). Swimming pools (heated). Play areas. Tennis. Five-a-side. Fronton. Boules. Gym. Barbecue. Bicycle hire. Miniclub. Entertainment. Satellite TV. Internet. WiFi over site (charged). ATM. Torches useful. 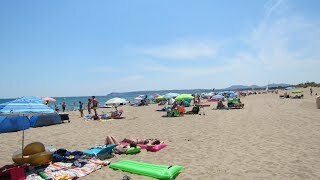 Sant Pere Pescador is south of Perpignan on coast between Roses and L’Escala. From the AP7/E15 take exit 4 onto N11 north towards Figueres and then C31 towards Torroella de Fluvia. Take the Vilamacolum road east and continue to Sant Pere Pescador. Site well signed in town.